The AdderView DDX30 is a new breed of high performance KVM Matrix that provides powerful functionality inside a small, compact form factor. Featuring Adder’s trusted lossless KVM extension technology with flexi-port switching capability, the DDX enables multiple users to access multiple computers located safely and securely inside your server room. 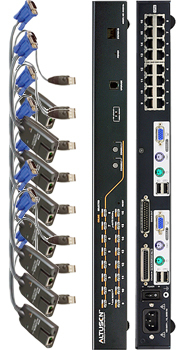 For the aviodance of doubt, this advanced DVI Matrix can be configured as 7 users to 23 computers or 29 users to 1 computer and anything between. The AdderView DDX10 is a new breed of high performance KVM Matrix that provides powerful functionality inside a small, compact form factor. Featuring Adder’s trusted lossless KVM extension technology with flexi-port switching capability, the DDX enables multiple users to access multiple computers located safely and securely inside your server room. The KH2516A KVM switch is a control unit that allows IT administrators to access and control multiple computers from two PS/2 or USB KVM consoles (one bus). Operators working at up to two consoles can independently and simultaneously take control of up to 8 computers. By daisy chaining up to 15 additional switches, as many as 128 computers can be controlled from the original KVM consoles. 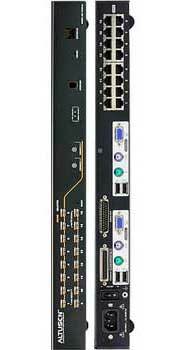 ATEN's KVM over IP switches now support the new Control Center Video Session Recorder (CCVSR) software. The CCVSR records all operations made on servers accessed through KVM over IP switches. Every operation and change from the BIOS level to logging in, from running software applications to configuring the operating system- is recorded and saved to a secure video file as evidence, without exception. With dual on-board NICs, the KVM over IP switches are built for reliability, to ensure 24/7 availability of remote access to all server room computers. Should one of the IP become unavailable, the other will take over in order to keep the system functioning normally..
ATEN’s 4th generation of KVM over IP switches exceed expectations. The KN2132VA features superior video quality (HD resolution of 1920 x 1200), FIPS 140-2 with level 1 security standards and virtual media transmissions at twice the speed. The KN series provides local console and remote over IP access for users to monitor and access their entire data center over a network. In addition, it offers out-of-band access with external modem support for BIOS level troubleshooting when the network is down. Dominion KX consists of two components: the digital KVM switch and Computer Interface Modules (CIMs). 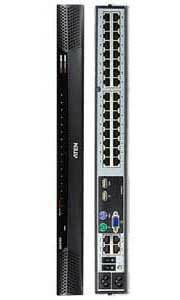 The switch connects to each CIM and provides KVM Over IP capabilities for remote access, as well as a local access port for controlling servers at the rack. A true data center appliance, Dominion KX provides its entire feature set out-of-the-box: 128-bit encryption, remote power control, dual failover Ethernet, LDAP, RADIUS, and Active Directory integration. The KX116 is an affordable appliance that's perfect as a single rack solution for budget-conscious customers. The KX116 supports a simple, robust one KVM switch per rack deployment model that reduces cabling and simplifies installation. The KX216 is an ideal single-rack solution for customers with multiple systems administrators. The KX216 supports a simple, robust "one KVM switch per rack" deployment model that reduces cabling and simplifies installation. Raritan pioneered the 32-port KVM-over-IP switch, which reduces the number of KVM switches required, lowes costs, installation time and maintenance effort. 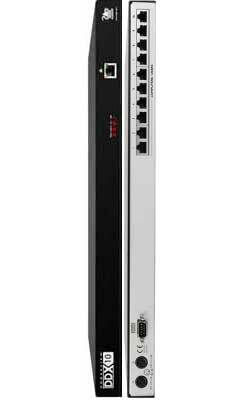 The KX132 supports a single, dense rack that reduces cabling and simplifies installation. It can also support two or more racks via its 150 foot distance capacity between the switch and target server. 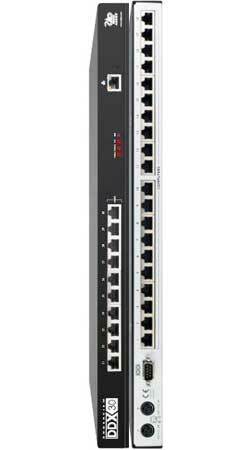 Designed to provide added benefits to its users the new switch range offers increased density, increased distances, enhanced cable management and multiplatform capabilities over traditional KVM Switch platforms. Using either a PS/2 or USB dongle at the server end of the installation allows a user to cost effectively specify the switch to match the exact server configurations.